If you’re having technical issues with one of your Dyze Design product and can’t find what you’re looking for in our installation and guides section, open a ticket and our support team will help you. 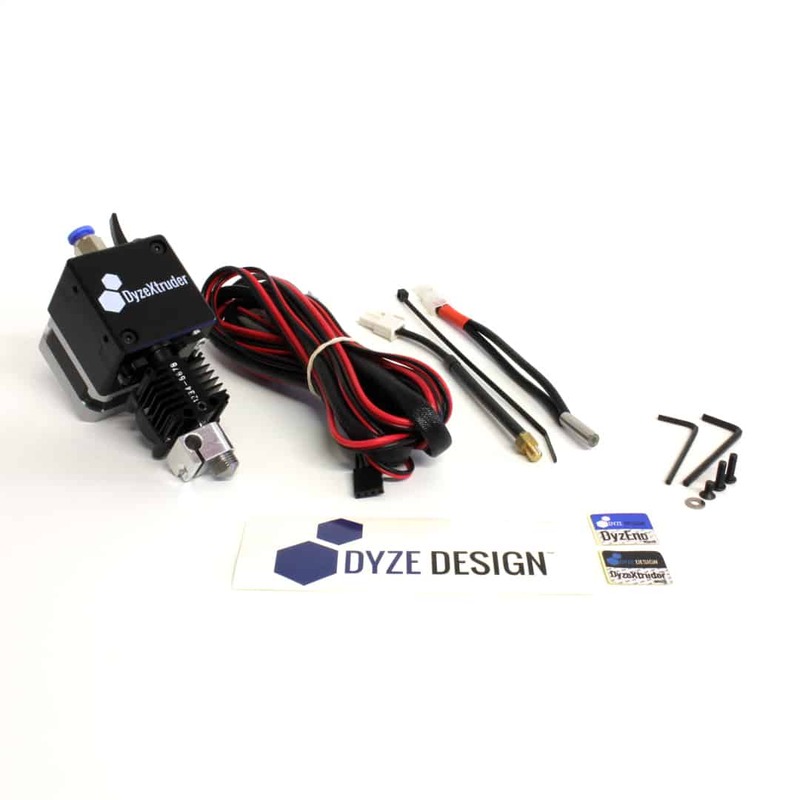 Dyze Design’s Extruder & Hotend kit: High Temperature, Fast print with High Pushing Force. The aluminum melt block transfer heat very quickly to the nozzle for an efficient and very fast printing speed. Furthermore, the long melt zone can handle very high filament feed without any trouble. A titanium alloy has been meticulously chosen to provide both stiffness and low thermal conductivity, limiting heat losses to the cold side. The high temperature sensor used inside the DyzEnd-X enable precise readings up to 500°C. Any thermoplastics can be used with the DyzEnd-X. The heated zone is made entirely from metals which can withstand very high temperature before losing mechanical properties. Even the sensors and heaters are protected by high temperature resistant sleeves. 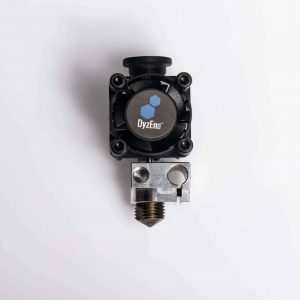 The DyzEnd-X comes built in with high wear resistant nozzle. The performance have been measured and tested. 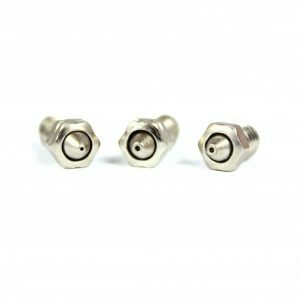 By using a very special high temperature sealing washer, the DyzEnd-X is able to switch nozzles at room temperature. No leaks, no burning hazard. The filament is very well guided inside the DyzEnd-X, which allows very high speed with flexible filament. The DyzEnd-X perform very well in retraction. The secret is its manufacturing process which enable very low friction inside the tube. The unique high temperature sensor has a resolution of 0.16°C at 210°C which is better than a amplified RTD sensor and a thermocouple. 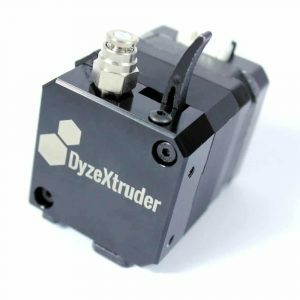 The DyzEnd-X is a high-end product and comes preassembled and tested avoiding the user to have any trouble receiving substandard part that are hard to assemble or fit together. The DyzEnd-X comes with connectors for each electrical component so you can easily maintain it. The DyzEnd-X can be easily converted to a liquid cooled setup with Dyze Design’s specialized cooling blocks. The DyzEnd-X is compatible with a M8x1.25 push to connect fitting. 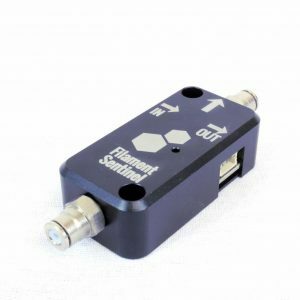 The 4mm PTFE tube can be inserted through the connector and guides the filament as far as possible inside the hotend. The hotend mounting mechanism is based on the form factor called “Groove Mount”. 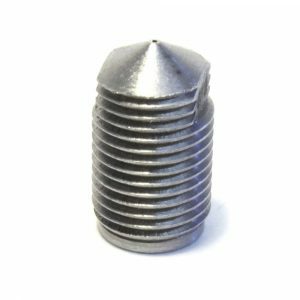 The 12mm groove makes it very easy to switch and maintain your hotend and nozzle. The sensor is installed with elegance using a brass housing. This ensure every hotend read the temperature properly without any variation caused by assembly. By using a low conductivity transition tube, the DyzEnd-X is designed very small. This enables you to use your build volume more efficiently. The DyzEnd-X can heat very quickly. In only 70 seconds, it reaches 210°C. The unique serial engraved on each hotend protects the product against clones. Also, it assures a tracking of suppliers, assembly and quality reports. The DyzeXtruder GT has a 5.65 : 1 gear ratio. This ratio has been chosen to use the full potential of a very small motor while, enabling very high pushing forces. The gears are custom made from high strength hardened steel and brass. This combination allows low friction operations and a longer life. The gears and bearings are designed to last for hundreds of kilograms in extreme conditions. Spring tension is a key factor to a good and reliable extruder. Having the ability to adjust the tension present several challenge. Applying too little pressure causes the filament to grind before the motor reaches its full potential. However, applying too much pressure causes the motor struggles against friction, inducing filament deformation, and losing torque that would otherwise be available to push the filament. Adjusting the pressure from a spool to another can also yield inconsistent results. The dual-pinch system allows a higher pushing force with a lower filament pressure. It reduces the risk of flattening the filament when highly detailed prints require a lot of retractions. The combination of reduction gear, dual pinch and unique design enables the DyzeXtruder GT to push as much as 9 kg (20 pounds) of force. This is more than necessary for all 3D printing applications. The unique lockable lever makes filament change very easy and convenient. The locking mechanism holds the lever in position while you change the filament. After, simply push back the lever to disengage the locking mechanism. The DyzeXtruder GT is not larger than the NEMA 17 it uses, making it very space efficient on a multiple extruders configuration. Saving space on a carriage can allow you to print larger parts on a single printer. The gear ratio was chosen to get the best of a very small motor.The DyzeXtruder GT is a lot lighter than a traditional extruder with a planetary gearbox, allowing for faster printer accelerations. 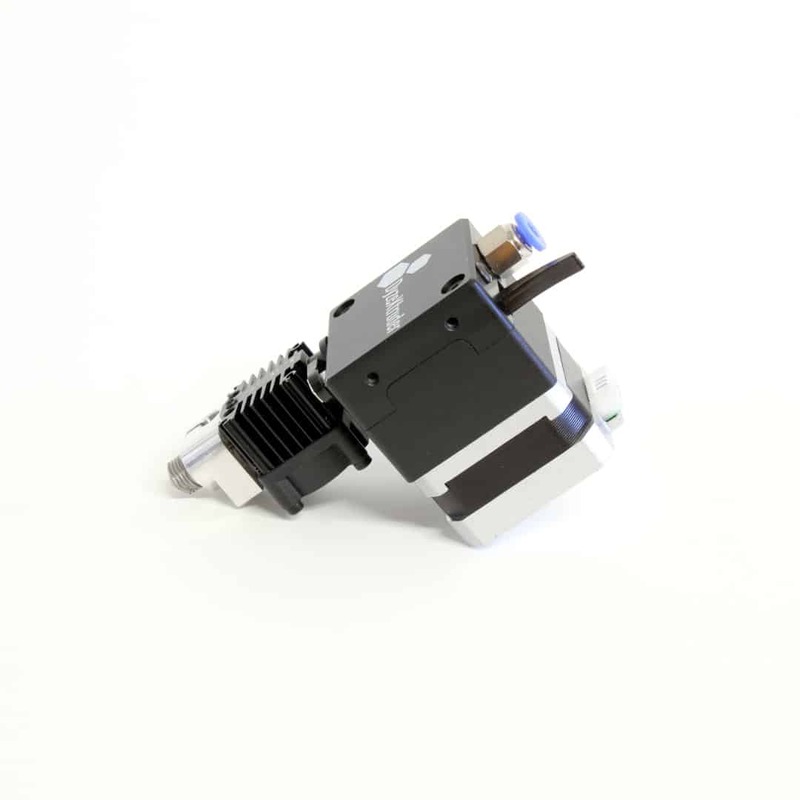 The aluminum housing is designed to offer a reliable operation, even in a high temperature environment. The unique tooth profile allows a 4-contact point on the filament, increasing even more the maximum pushing force. Combined with the dual pinch drive, it can unlock the full potential of a geared motor and prevents any damage to the filament during printing. 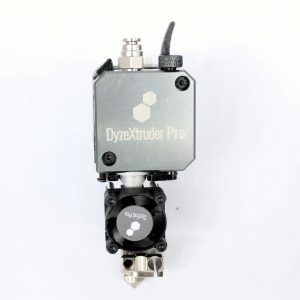 The DyzeXtruder GT is a high-end product and comes preassembled and tested; thus ensuring users won’t receive substandard parts that are hard to assemble or fit together. The filament is very well guided inside the DyzeXtruder GT’s main frame, which allows very high speed with flexible filaments. The unmatched design prevents any flexible filament from leaking inside the mechanism. The drive system allows a superior filament alignment between the teeth for optimal prints. The DyzeXtruder GT always comes with a special push to connect fitting. APTFE tube can be inserted through the connector to guide the filament as far as possible inside the mechanism. A single modification in the firmware can easily transform a direct drive setup into a bowden. The hotend locking mechanism is very practical and rigid.You can secure the hotend in place with only a screw. You can remove it even if there is still a filament inside the extruder due to its turning mechanism. No more hassle of disassembling your setup when you need to maintain your printer. The side mounting threads make it very easy to assemble; only two M3 screws are needed to fit the DyzeXtruder GT in a printer. The DyzeXtruder GT can be easily converted to a liquid-cooled setup with Dyze Design’s specialized cooling blocks. 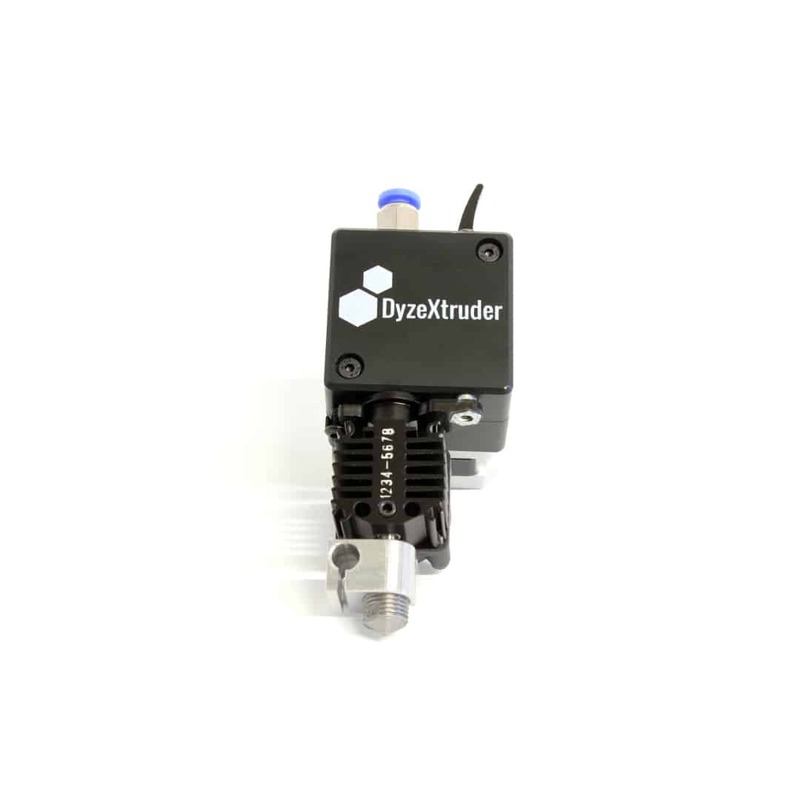 The DyzeXtruder GT is optimized to work perfectly with Dyze Design’s DyzEND-X hotend. The best results are achieved when pairing these two products. The DyzeXtruder GT comes with connectors for its motor so you can easily maintain it. Dyze Design’s Pro SerieExtruder & Hotend kit: High performance, high speed, high flow, high-temperature, and high pushing force. Equipped with an ultra wear resistant nozzle in tungsten carbide. High quality and all metal extruder that is able to print any kind of material. High pushing force and dual pinch drive system. High Temperature and Fast print 3d printer hotend. Get the latest news, updates and special offers delivered directly in your inbox. © 2019 Dyze Design. All Rights Reserved.